Trains are amazing! Did you know that trains were the catalyst in revolutionizing America? It was the First Transcontinental Railroad built in the 1860’s that traveled across North America, connecting California to the Eastern US, and which linked everything in between. They connected rivers to towns, and cities to cities. Not only were they an integral part of starting America’s Industrial Revolution, they are still a large and vital part of the nation’s transportation network, transporting cargo, lumber, cars, and people everywhere. Bedazzle your kids and take them to learn about the history of these trains at model train shows in the New Jersey and New York area. Plus, you may bump into Santa at some of them! Annual Light and Sound Show and open house. The club's HO scale layout is transformed into a theatre and the trains run to a professional narrated script. Event enjoyed by thousands of guests every year. 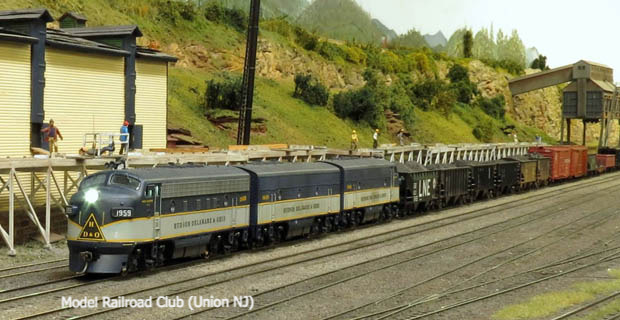 Garden State Model Railway Club, 575 High Mountain Road, North Haledon. Great model railroad show featuring intermodal, mixed freight, coal & passenger trains - both steam & diesel. Kids can view a Special Santa Claus Express train from a Grand Stand platform. Ride with Santa Claus on beautifully decorated trains. Santa talks to every child on the train. FREE. Holiday model train show - fun for the whole family. FREE. Annual New York Transit Museum train show. Marvel at model trains traveling through a mini NYC. Visitors go on an imaginary journey from Grand Central to the North.